Shane Warne is one of the greatest bowlers of all time. His record of test wickets is 708 wickets in 145 tests, at an average of 25.. He is undoubtedly one of the greatest exponents of leg spin bowling of any era. 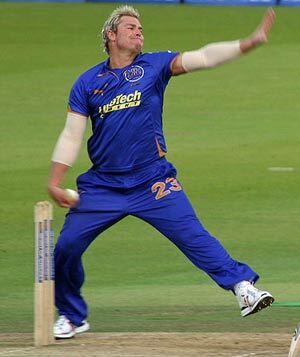 Shane Warne helped to promote leg spin bowling at a time when fast bowling was very dominant. With his flop of blond hair Shane Warne was one of the great characters of the game. At times he could court controversy, but, he is primarily remembered for his vast array of googlies, leg breaks and other armour of his leg spin. My life was falling apart and then to come out and play and have my best ever – 40 wickets, 250 runs… But the only reason I could do that was because of the way I thought and I think I’m pretty strong mentally. I think I am anyway, pretty strong to get over whatever it is. Shane Warne helped cement Australia as the dominant cricketing force of the 1990s and 2000s. In particular, he was dominant in Ashes series against England. One of the great moments of the game is his first ball to dismiss Mike Gatting (who had recently come out of retirement). The ball pitched outside leg stump when behind Mike Gatting’s pads and clipped the off stump bail. The ball must have spun at least a foot and completely outfoxing Mike Gatting.